Suicide Notes Talk Too Late. They are discovered after the fact—when it’s too late to talk, and there’s no time left to ask questions, or tell someone who could help. Suicide notes talk too late. They are discovered after the fact—when it’s too late to talk, and there’s no time left to ask questions, or tell someone who could have helped. 42,773 people in the U.S. die every year as a result of suicide. Men are 3.5 times more likely to attempt suicide than women. For every successful suicide, there are 25 attempts. On average, 117 people in the U.S. die every single day at the hands of suicide. The World Health Organization estimates that at least one million people die every year, which means that the suicide mortality rate is one death every 40 seconds. Even worse, it is predicted by 2020, that number will increase to one death every 20 seconds. These are statistics we simply cannot ignore. September 5-11, 2016, is National Suicide Prevention Week, and we want to do our part in preventing suicide. The video above features men who found a way through. 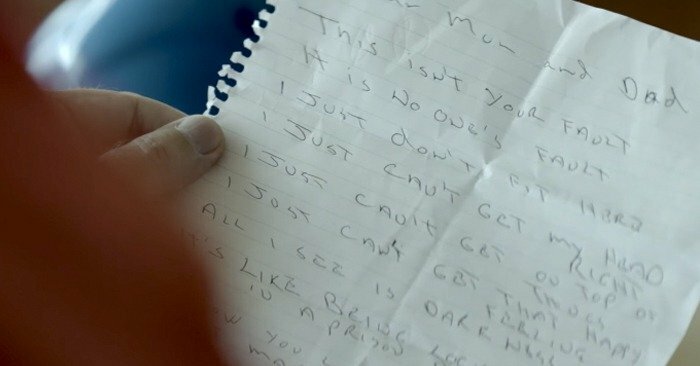 Their notes are heartbreaking, but the beauty in this powerful video is that they are still here to read those letters today. So what can you do to prevent suicide? Too many people believe that bringing up suicide to a suicidal person is just adding fuel to the fire. As if your conversation about suicide will give them ideas and make things worse. The opposite is true. Talking openly, honestly and vulnerably about suicide, depression, feelings and mental health is truly the best way to connect with someone who desperately wants to be saved. Hard conversations are always worth it. Be intentional with your relationships and be able to recognize if someone’s behavior is changing, they have worsening depression or are simply them distancing themselves from life. Ask them how they’re doing, ask them what they’re struggling with and be vulnerable with your own struggles to engage in deeper conversation. Nobody should ever feel alone, and the greatest way we can combat suicide is talking to one another. Tell someone. If you or someone you know is contemplating suicide, or acting differently, tell someone. Losing a friendship is nothing to be afraid of. You have the power to save a life. But you can’t do it on your own. There are a lot of myths about suicide. For example, people who talk about suicide won’t actually do it. This is SO wrong. Every person is different, and every circumstance is different, but almost everyone who attempts or commits suicide has given some type of clue or warning. It’s important to know that anyone who tries to kill themselves is not crazy. They’re hurting. And even if someone is determined to kill themselves, it doesn’t mean that you can’t stop them. Even the most severely depressed person probably has mixed feelings about death. Just because someone is determined to end things doesn’t mean you should give up on them. We know that their life is worth living. Find your determination, and combat suicide with your will to never give up on someone you care about. SHARE this message, and help us #tosavealife.